You can now work with your Laptop / Netbook at ease. It is a must-have accessory for those who work on laptops and netbooks. It carries a style quotient. The Laptop table can be used as a portable laptop table, laptop holder, bed table, reading table and many more. It can be used in the car during long travels. You can now laze around in your lounge or bed and use this lovely product. It can also be used as a breakfast table, reading and writing table etc. This product is multi-functional. It has an effective cooler for laptops / netbook. It has dual fans powered by the USB port on notebooks which drain away the heat from laptops. The portable table is well designed to suit the aesthetics of the current generation. It has a small footprint and can be easily folded and fitted into your laptop bag. The table can also be adjusted to different height settings conveniently. It is made of high quality plastic and is equipped with a cup tray and mouse pad. The product can be easily dismantled and packed and is well portable. 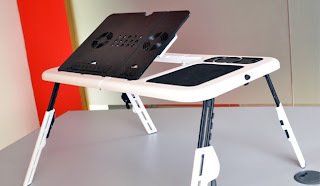 The structure of the table is suitable for any sized laptop with legs adjustable to any comfortable angles, when in use.